This pasta tastes like sea and totally in a good way. It's very juicy, filling and flavorful. I usually make it, when I crave something more "fishy". If you like seaweed, then you will probably love this pasta. Put the pasta in the boiling water. 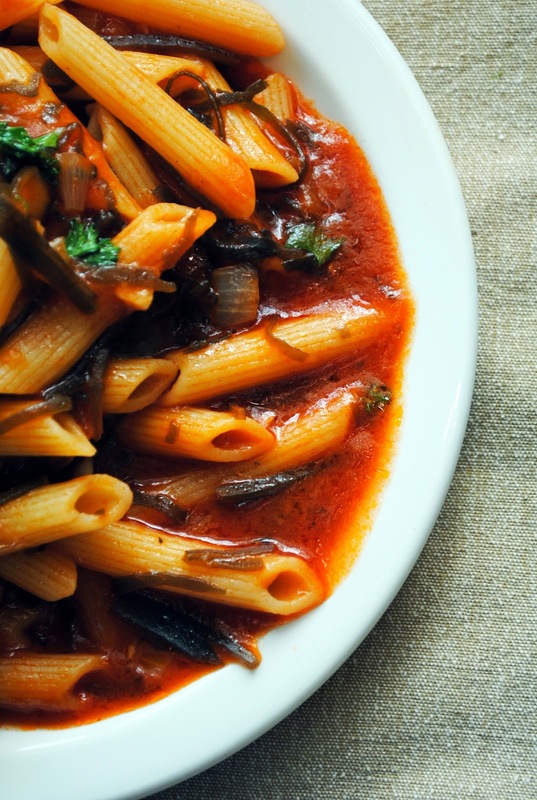 When the pasta is boiling, you can prepare the sauce: heat up some oil on a pan and add chopped garlic. Fry for a couple of minutes. Add seaweed and chopped garlic. Stir and fry for about a minute. Add tomato juice, soy sauce to taste, brown sugar and ground black pepper. Stir and boil for a couple of minutes. When the pasta is almost soft (al dente), drain it and mix it with the sauce. Serve right away.